8h00: Car and Vietwind Travel’s tour guide pick you up at hotel and start the tour “ exploring 4 saint temples protecting thang Long – Hanoi”- the pride of Hanoian. 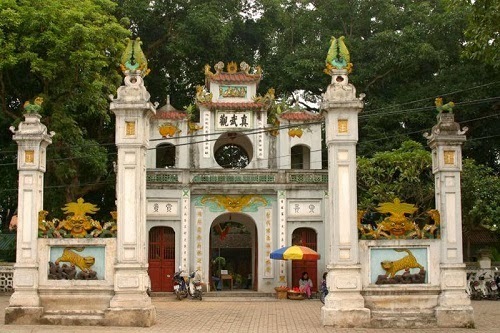 First you will visit Quan Thanh temples ( Tran Vu temple) located on the Thanh Nien street, ba dinh Dist, Hanoi. is dedicated to Huyen Thien Tran Vu a deity mentioned in both Vietnamese and Chinese legends. He is credited with having helped Vietnamese people to drive away ghosts, evil spirits, and foreign invaders. The temple that guards Hanoi to the South is Kim Lien temple. This temple was built as an altar to Saint Cao Son. You will visit Hanoi Old Quarter, visiting Hoan Kiem lake, Ngoc Son temple and Bach Ma temple (White Horse) Temple - the oldest of the four sacred sites is Bach Ma, located at 76 Hang Buom Street, Hanoi. Bach Ma Temple was built in the ninth century to worship Long Do (Dragon's Belly) - a patron saint of Hanoi. After that, you can stroll around Hanoi Old Quarter, exploring Hanoi street food, and Hanoi coffee. 18h00: End up the tour and see you again in the next journey of Vietwind Travel. - Water bottle on the car.